WRITER AS AN OPINION MAKER. Every writer has an inbuilt value system which gets reflected in his/ her writing. To that extent , every writer influences readers and hence is an opinion maker. However , the trouble begins when a writer espouses a particular cause through his/ her writings and through the mass media. I am using the word trouble only in the context of its potential damage to the cause and to the creative writing that the writer pursues in all earnestness. There is ( or there can ever be) no trouble with the writer , as an individual , championing any cause of his/ her choice. However , it is troublesome when that advocacy creeps into that writers creative writing. Let us examine why it is so. As far as creative writing is concerned ,every creative writing is imbued with values that are integral to the emotional ecosystem of the writer. This is inevitable. It is inevitable because its expression in creative writing is governed by subconscious mind. Therefore critics try to deconstruct creative writings of an author ( or creative writings of any given time period) to understand the nature of creative processes( or the social transformations). Thus critics provide frame of reference in which these writings must be appreciated. When a writer chooses to espouse a particular cause in a conscious manner and tries to smuggle that into his/ her creative writing, it mars the final product. However one may define good literature , one must admit that any attempt to inject some external doctrine into that would inevitably lead to compromising the literary merits of that writing. By and large , great names in literature have eschewed such tendencies. However , the situation is quite different when it comes to advocacy for various causes by writers outside of their creative writings. When writers( particularly the famous ones) openly advocate for their favorite causes , they end up causing semantic confusion in their followers minds. This is not to suggest that these individuals ought not to have strong belief in some social causes . They ,like everyone else , can have their social preferences and ideological leanings. They ought to pursue them with commitment and sincerity , but only in one’s personal capacity. This can be in several forms viz. in the form of voting for particular political party or in the form of contribution to the agencies active in that domain or in the form of devoting their productive time for that cause. However the trouble begins when they try to leverage their fame and goodwill earned through their creative writing to influence their readers. This undermines not just the reader’s ability to judge the relative merits of the issues involved but it also undermines the intrinsic value of the cause itself. This , in my opinion , is unethical. Let me clarify . I am convinced that these writers would be justified in articulating a reasoned expression of their cause in the form of serious critical writings. However , such writings must be based on scholarship and analytical thinking. Anything in the form of propaganda and strident posturing would obfuscate the the whole issue. The original cause would not be served by the advocacy of such writers. I think this tendency to champion a particular cause in creative writers arises due to category mistake. Being creative individuals , these writers are gifted with insights into human nature. However , in my opinion , being insightful is not same as being wise. As a writer one can have insights into inner workings of our emotional ecosystem, one can not confuse that with wisdom. Creative writing is an innate skill not subject to analytical deconstruction. It is an opaque ability. It does not necessarily make one wiser. Just as a good painter need not necessarily be a good optometrist , a good creative writer need not be man of wisdom. However , many writers make this category mistake and convince themselves to be wise persons. In my opinion , creative writing is strictly a private exercise and one must preserve its sanctity. In fact , that is the reason why I have chosen to write under a penname. Finally , such an advocacy conflicts with the very process of creative writing. In the final analysis , the advocacy for any particular cause requires certain evangelical zeal. This is possible only when one is blind to certain logical arguments antithetical to the cause that one wishes to espouse. This intellectual blindness to uncomfortable aspects of the cause is in direct conflict with creative writing. Creative writing begins with the premise that the writer would pursue deconstruction of human mind through literary devices that his/ her sensibility can create. The writer remains faithful to this deconstruction even if it leads to uncomfortable insights into his/ her mind as well as that of the society he/ she lives in. The creative writing is an act of moral courage of facing and owning these insights however uncomfortable they may be. This willingness to be a contrarian is in direct conflict with the evangelical zeal that is a prerequisite for advocacy for the cause. This sums up my own view on the role of creative writer as an opinion maker. Writing under a pen name was my conscious choice. Now, while launching my first book under that pen name has given me an opportunity to ponder over the ethics and propriety of using a pen name. I would like to share my thoughts about it. In addition , I would also like to discuss the reasons for choosing this particular pen name. I have been toying with the idea of writing a novel since my college days. At that time ,I was in awe of several writers. However , I was determined not to write like them. I wanted authenticity of my own experiences and originality of my own ideas to come through my novel. Strangely , when I attempted to write during my college years , I was struck by two deficiencies in my writing. Firstly , I found myself echoing my favorite writers’ style. Secondly ,whenever I consciously tried to write original matter , it turned out to be preaching in disguise of novel. I decided at that time to postpone the whole exercise till I had acquired such skills. In retrospect , I think the deciding factor was my own ego ( or rather its dominance). My insistence on originality was camouflage of my ego. However ,I was not aware of this at that time. As my career entered a hectic phase , the urge to be a writer receded into background. With passage of time , and after few professional setbacks , I was forced into reviewing my life and my own priorities. I realized that I needed to analyze myself and try to understand what could have gone wrong with my life. In the process of self analysis ,I realized that the best way to do it would be to articulate my own feelings. That realization revived my urge to be a writer. Thus began this phase of my career. Since my attempt to write a novel was prompted by my need for self analysis , I made a conscious choice of eliminating all my personal details from the narrative. The process of writing such self analytical piece is rather complex. One may remove personal details but what about personal emotions ? If I were to remove my own emotions as well ( in fact the whole mélange of them) how could I achieve self analysis ? That is where I discovered the merits of catharsis and universality of human experience. I realized that good literature works because it integrates with the reader’s emotional ecosystem( due to its universality) and induces catharsis in that emotional ecosystem. Therefore a novelist has to create a universal expression out of his / her private experience and allow the newly created expression to run it’s natural course. The novelist becomes a passive observer of that universal expression as it unfolds itself in all its intricate details. If this is how creative writing comes about , why should writer hide behind a pen name ? When I look back ,I see two considerations that prompted me to assume a pen name. First reason was of course a personal one. The issue of privacy is not straightforward. To begin with ,I am a private person by temperament. I am comfortable remaining in the blurred background without being noticed by anyone. In that sense ,writing under a pen name is my natural response. Moreover , there are large number of people with whom I have professional and personal associations. It would be natural for readers , who have known me otherwise , to infer parallels between my personal life and the narrative unfolding in the book. In my opinion this is inevitable and unfortunate. The best solution is to write under a pen name. That itself would protect my acquaintances from any imputations. Second reason for my decision to write under a pen name is social one. In my opinion , creative writing is a specific skill. It does not confer any special wisdom on its practitioners. However ,should any writer acquire success and recognition because of his/ her skills , that individual is tempted to assume the role of social commentator ( and worse social reformer). I admit that such a fallacy is human. However , I am very clear that these two roles must be kept separate and at least I ought not to transgress my role of being a writer and should never assume the second role. The best way to do that is to remain incognito. That would ensure that media would never be focused on me and I would never be tempted to arrogate the role of a wise man. I am , let me admit ,just a narrator . I referred to my earlier attempt to write and my realization that my notion of originality was a camouflage for my ego. With the passage of time I have travelled to diametrically opposite position. My choice for opting for a pen name seems to be an exact negation of that egoistic position. However , when I look back I do not see any such moral evolution in my perspective. I am still full of myself. I have moved from autonym to pseudonym , but my journey from pseudonym to anonym has yet to begin. That evolution would begin when I internalize this majestic universe in my psyche and create a hymn in its beauty. Presently it is human predicament that occupies my sensibility and I would devote my creative writing to that predicament. My ego has expanded to include various facets of human angst but it is still egocentric. My journey from egocentric to epic has not even begun. In that sense , my opting for pen name is just a first tentative step to that cosmic perspective. I now realize how great the writers of our scriptures must have been. They experienced not just the universality of human experience but also the unity of human experience with the cosmos itself. They did not need even a pen name. I have reached to level of pen name from my personal name. I hope to travel to the level of anonymity and narrate the universe in all its majesty one day. Once I had made up my mind about writing under a pen name , the question of what that pen name must be arose. I toyed with several possible names. Finally I realized that the pen name must reflect the fact that I began as an avid reader and only then transformed into a writer. My empathy is always with the readers. My writing is more of an attempt to connect with the readers than to provide any wisdom. In that sense, the name “ Vaachakmitra “ seems suitable. I see myself as a reader who graduated from being a reader to being a writer. In that sense my pen name symbolizes my kinship with readers. There is a popular belief that first time authors of fiction tend to be autobiographical without any conscious efforts. While this belief seems attractive from Freudian perspective , there is no empirical evidence to support this belief. Having just published my first novel , I would try to relate my own creative writing and try to share my understanding of how this comes about. To be frank ,I have been a voracious reader of fiction and nonfiction books. Till I reached my forties , I did not imagine that I would write fiction. At some point in time , I realised that reading fiction amounts to surrogate living. It struck me that if I were to search for meaning and purpose in my life ,I would have to perforce give up reading fiction. Over a period of time , I also realized that search for meaning of one’s life is possible by analyzing one’s own mind. The bulk of my reading of literary criticism suddenly became relevant. I knew I had to write fiction. This crystallization was also hastened by series of crises in my personal life. Having made a conscious decision , I realized that to be original in my creative writing ,I must deliberately remove all external literary influences from my writing. In retrospect , I can say that it was a wrong inference. It was not wrong because it failed to improve literary content of novel. It was a wrong inference because these writers had already shaped my sensibility by the time I decided to stop reading fiction. Our creative writing is not influenced by external factors ( including the books that we read) in a linear fashion. The influence of some of the great writers whom I had read during my formative years still influence my sensibility. In fact some of the details of my novel , on rereading , do appear to be influenced by these writers. I think I must admit I was wrong in abstaining from reading fiction for last few decades. Strangely ,I am still struck with that habit and I cannot bring myself to reading fiction. In that sense , readers of my novel (and this blog) are really blessed. Let me write about autobiographical undertones in my novel. Just as I was firm about not being influenced by literary styles and sensibilities of my favorite writers , I was determined to not to be autobiographical. When I look back , after reading this novel several times during the processes of publishing ,I have a slightly different perspective on this issue. I had two prime objectives while writing this novel. I wanted to understand my own emotions and their subconscious origins. In the process I allowed my subconscious to develop the story as the plot unfolded.I was hoping that on subsequent reading , I would be able to know how my subconscious mind works. Whatever I could deconstruct , I was surprised by the outcome. However , in order to allow my subconscious work freely, I ensured that my emotions were honestly allowed to participate in the creative process. Therefore this novel is true to what my emotional status was at that time and therefore it is autobiographical in that sense. The second prime objective of my writing this novel was to transcend my personal angst to the universal level. I wanted to eliminate all my personal details and my immediate circle , one by one , so that what remains is pure universal human predicament. Therefore the narrative retains all geographical and social details sans any personal details. I believe that to the extent this novel describes human predicament in a distilled manner , this novel must qualify as a genuine literature. I am not sure whether this novel would be judged as a good novel or not . However ,it is a serious attempt to deconstruct human mind . I am also sure that this novel is autobiographical only in a sublime sense. I would end this blog by a question. If the first time authors of fiction tend to be autobiographical , then when they write second book ,does this autobiographical undertone remain as strong or does it disappear ? I hope to find out that when I finish my next novel. I am not sure when that would happen ,but I am sure it would . I have couple of narratives in mind ,but I am not sure which one would result in my next novel. 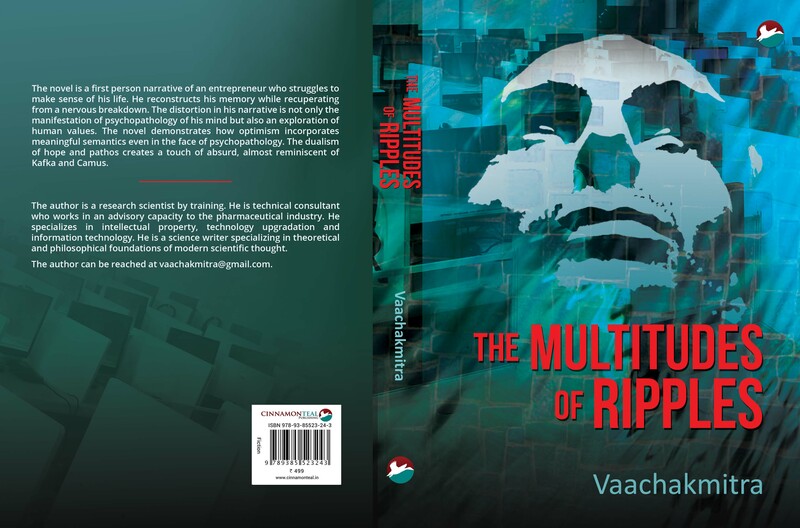 Till then the readers may enjoy THE MULTITUDES OF RIPPLES.